This test is most commonly done in order to check for the presence of a blood clot or abnormal blood flow inside the lungs (such as a pulmonary embolism (PE) although computed tomography with radiocontrast is now more commonly used for this purpose. The V/Q scan may be used in some circumstances where radiocontrast would be inappropriate, as in renal failure. A V/Q lung scan may be performed in the case of serious lung disorders such as chronic obstructive pulmonary disease (COPD) or pneumonia as well as a lung performance quantification tool pre- and post-lung lobectomy surgery. Ventilation-perfusion scintigraphy in a woman taking oral contraceptives and valdecoxib with a pulmonary embolism. (A) After inhalation of 20 mCi of Xenon-133 gas, scintigraphic images were obtained in the posterior projection, showing uniform ventilation to lungs.. (B) After intravenous injection of 4.1 mCi of Technetium-99m-labeled macroaggregated albumin, scintigraphic images were obtained, shown here in the posterior projection. This and other views showed decreased activity in the following regions: apical segment of right upper lobe, anterior segment of right upper lobe, superior segment of right lower lobe, posterior basal segment of right lower lobe, anteromedial basal segment of left lower lobe, and lateral basal segment of left lower lobe. Decreased uptake of the inhaled radioisotope may indicate an impaired ability to breathe, airway obstruction, or possible pneumonia. Decreased circulation of the injected MAA indicates a problem with blood flow into or within the lungs. A localized area of decreased uptake, usually in a wedge shaped (or pie shaped) configuration with normal ventilation images (mismatched defect) suggests a pulmonary embolus or blood clot in the lungs, which leads to reduced perfusion beyond the obstruction. Although this test uses radioactive materials, the total amount of radiation exposure is low. Typical effective doses for a V/Q scan range from 1-5 mSv. In order to decrease the radiation exposure in pregnant patients, the total radioactivity administered may be decreased or the ventilation phase omitted. A CT pulmonary angiogram (CTPA) with radiocontrast can alternatively be performed, although this can result in a greater radiation dose to the patient. The ventilation and perfusion phases of a V/Q lung scan are performed together and may include a chest X-ray for comparison or to look for other causes of lung disease. A defect in the perfusion images requires a mismatched ventilation defect to indicate pulmonary embolism. In the ventilation phase of the test, a gaseous radionuclides such as xenon-133, krypton-81m, or technetium-99m DTPA in an aerosol form is inhaled by the patient through a mouthpiece or mask that covers the nose and mouth. Ventilation imaging can also be performed using a Technegas machine which produces an aerosol of radioactive nanoparticles, specifically carbon nanoparticles containing technetium-99m. The perfusion phase of the test involves the intravenous injection of radioactive technetium macro aggregated albumin (Tc99m-MAA). A gamma camera acquires the images for both phases of the study. A SPECT image can also be taken following an injection of Technetium labelled MAA. SPECT is often skipped if the patient has pulmonary hypertension. It is also possible to perform the scan with positron emission tomography (PET) rather than conventional gamma camera scintigraphy. This has been performed with Gallium-68 labelled carbon nanoparticles (Galligas) using a conventional Technegas machine for ventilation images, and with Gallium-68 labelled MAA (Ga68-MAA) for perfusion images. PET has multiple potential advantages including superior resolution, speed and quantification. ^ "Pulmonary ventilation/perfusion scan". University of Maryland Medical Center. Retrieved 3 January 2018. ^ "2014 ESC Guidelines on the diagnosis and management of acute pulmonary embolism". European Heart Journal. 35 (43): 3033–3073. 14 November 2014. doi:10.1093/eurheartj/ehu283. PMID 25173341. ^ "Managing suspected pulmonary embolism". NICE. National Institute for Health and Care Excellence. January 2015. ^ Nigel Key; Michael Makris; Denise O'Shaughnessy; David Lillicrap (3 July 2009). Practical Hemostasis and Thrombosis. John Wiley and Sons. pp. 140–. ISBN 978-1-4051-8460-1. Retrieved 14 November 2010. ^ Mason, Robert J.; Broaddus, V. Courtney; Martin, Thomas R.; King, Talmadge E.; Schraufnagel, Dean; Murray, John F.; Nadel, Jay A. (2010). Murray and Nadel's Textbook of Respiratory Medicine. Elsevier Health Sciences. p. 477. ISBN 1437735533. ^ Parker, J. A.; Coleman, R. E.; Grady, E.; Royal, H. D.; Siegel, B. A.; Stabin, M. G.; Sostman, H. D.; Hilson, A. J. W. (26 January 2012). 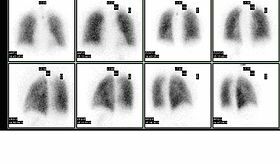 "SNM Practice Guideline for Lung Scintigraphy 4.0". Journal of Nuclear Medicine Technology. 40 (1): 57–65. doi:10.2967/jnmt.111.101386. PMID 22282651. ^ a b Bajc, M.; Neilly, J. B.; Miniati, M.; Schuemichen, C.; Meignan, M.; Jonson, B. (27 June 2009). "EANM guidelines for ventilation/perfusion scintigraphy". European Journal of Nuclear Medicine and Molecular Imaging. 36 (8): 1356–1370. doi:10.1007/s00259-009-1170-5. ^ Anderson, David R.; Kahn, Susan R.; Rodger, Marc A.; Kovacs, Michael J.; Morris, Tim; Hirsch, Andrew; Lang, Eddy; Stiell, Ian; Kovacs, George; Dreyer, Jon; Dennie, Carol; Cartier, Yannick; Barnes, David; Burton, Erica; Pleasance, Susan; Skedgel, Chris; O’Rouke, Keith; Wells, Philip S. (19 December 2007). "Computed Tomographic Pulmonary Angiography vs Ventilation-Perfusion Lung Scanning in Patients With Suspected Pulmonary Embolism". JAMA. 298 (23): 2743. doi:10.1001/jama.298.23.2743. PMID 18165667. ^ Fogelman, Ignac; Clarke, Susan; Cook, Gary; Gnanasegaran, Gopinath (2014). Atlas of Clinical Nuclear Medicine (3rd ed.). CRC Press. p. 1075. ISBN 9781841847528. ^ Lobov, Sergei A.; King, David W.; Knox, Karen J.; Senden, Tim J.; Stephens, Ross W. (February 2013). "Cationised radiolabelled nanoparticles for perfusion imaging of the lungs". Biomaterials. 34 (6): 1732–1738. doi:10.1016/j.biomaterials.2012.11.022. ^ Waxman, AD; Bajc, M; Brown, M; Fahey, FH; Freeman, LM; Haramati, LB; Julien, P; Le Gal, G; Neilly, B; Rabin, J; Soudry, G; Tapson, V; Torbati, S; Kauffman, J; Ahuja, S; Donohoe, K (May 2017). "Appropriate Use Criteria for Ventilation-Perfusion Imaging in Pulmonary Embolism: Summary and Excerpts" (PDF). Journal of Nuclear Medicine. 58 (5): 13N–15N. PMID 28461589. ^ Hofman, M. S.; Beauregard, J. -M.; Barber, T. W.; Neels, O. C.; Eu, P.; Hicks, R. J. (2011). "68Ga PET/CT Ventilation-Perfusion Imaging for Pulmonary Embolism: A Pilot Study with Comparison to Conventional Scintigraphy". Journal of Nuclear Medicine. 52 (10): 1513–1519. doi:10.2967/jnumed.111.093344. PMID 21908388. ^ Bailey, Dale L.; Eslick, Enid M.; Schembri, Geoffrey P.; Roach, Paul J. (September 2016). "68Ga PET Ventilation and Perfusion Lung Imaging—Current Status and Future Challenges". Seminars in Nuclear Medicine. 46 (5): 428–435. doi:10.1053/j.semnuclmed.2016.04.007. PMID 27553468. ^ Velikyan, Irina (2014). "Prospective of Ga-Radiopharmaceutical Development". Theranostics. 4 (1): 47–80. doi:10.7150/thno.7447. PMC 3881227.